Even Apple's new iPhone 6 (Plus) is potentially about to enter the bigg-sized smartphone space, Samsung Galaxy Note 4 still receives wide popularity. The main reason lies in the exceptional mobile experience it can bring. 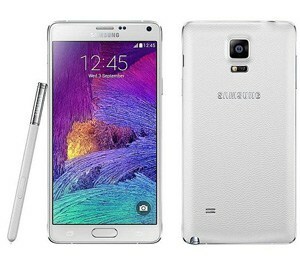 Coming along with 5.7-inch 4k screen with a Quad HD resolution, a Retina scanner and a UV sensor, expected to be shipped with a battery life larger than 3,200 mAh in the Note 3 and available in several storage variants including 16GB, 32GB and 64GB, this gadget places itself miles ahead of its competition when it comes to playing videos. Based on previous experience, Samsung Galaxy video formats present the major obstacle when users want to transfer videos to their Galaxy Notes, including Note 5, Note 4, Note 3, etc. To enjoy HD videos, TV shows, DVD movies on Galaxy Note 4, let's have a look at the video formats for Galaxy Note 4/5/7/8/9. Top all-in-one MacX Video Converter Pro allows you to convert video (HD & SD) to Samsung Galaxy Note 4/5/7/8/9, Galaxy S9 compatible formats like MP4, H264, AVI, MKV, WMV, FLV, etc. without any quality loss. Also download videos to Samsung Galaxy devices in batch from 300+ video sites. Though Galaxy Note 4 has been released yet and we can not tell the video formats Galaxy Note 4 support for sure at the moment, there are a few of video and audio formats that are always supported by Samsung Galaxy devices. The following audio and video formats are reasonably expected to be played on Galaxy Note 4/5/7/8/9. Tips: if you have any video in formats other than those galaxy note 4/5/7/8/9 video formats, just get a video converter for Galaxy Note to convert them to the formats listed herein. As only restricted ability is provided in Galaxy Note 4/5/7/8/9 as well as all other portable devices to support videos in different formats, you will inevitably get some videos in formats that cannot be played on Galaxy Note 4/5/7/9, such as MTS, TS, MOV etc. 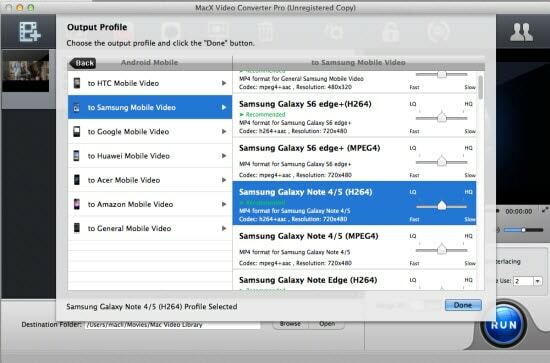 To put those videos on your Galaxy Note 4 smoothly, MacX Video Converter Pro may be what you need. This video converter can convert videos in any formats, including AVCHD, MTS, MOV to video formats supported by Galaxy Note 4/5/7/8/9. This Galaxy Note 4 video converter offers the fastest speed to convert videos to formats supported by Galaxy Note 4/5/7/8/9 by taking advantage of Intel's QSV hardware acceleration tech. Step 1: Run the Galaxy Note 4 video converter, click "Add Files" to load the video you want to convert. Step 2: Choose a video format for Galaxy Note 4/5/7/9 from the above list, like MP4, AVI, or M4V. 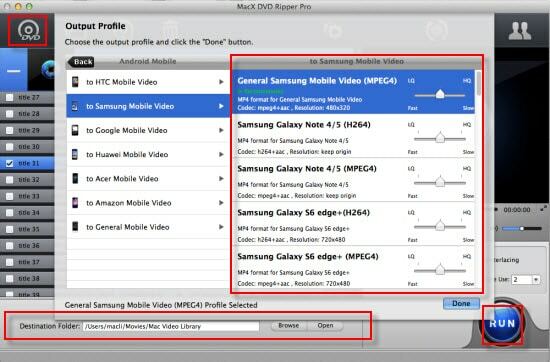 Or you may just choose the device in "to Samsung Mobile Video" directly. Step 4:Click "RUN" button to start converting video to Galaxy Note 4/5/7/9. Tips: This video converter also provides an easy solution to download and convert YouTube videos to Galaxy Note 4. You can enjoy those funny videos from YouTube offline in high quality. As aforementioned, Galaxy Note 4 comes with a 5.7-inch 4k screen with a Quad HD resolution of 1440 x 2560, it would be an extremely wonderful experience to watch HD videos like 4k or Blu-ray DVD on Galaxy Note 4. However, it's a common sense that DVDs cannot be played on any portable device as they lack the essential DVD drive. Here MacX DVD Ripper Pro can actually help cope with the situation. It can rip any DVD, including those protected by Disney DRM X-project or the common CSS, Region Code, UOPs, Sony ARccOS and other copy-protection technologies to the video formats supported by Galaxy Note 4/5/7/9, like DVD to MP4, AVI, FLV etc. Step 1: Download and install this DVD ripper on Mac OS X, click "DVD Disc" button to import DVD. Or you can import this disc by hitting "DVD Path". Step 2: Choose Galaxy Note 4 format from the above list. Or you can directly rip DVD to Galaxy Note 4/5/7/9 as well as other latest devices like Samsung galaxy tab S, Note 3, iPhone 6, etc from the device profiles list. Step 4: Click the "RUN" Button to start to rip DVD to Galaxy Note 4/5/7 on Mac.